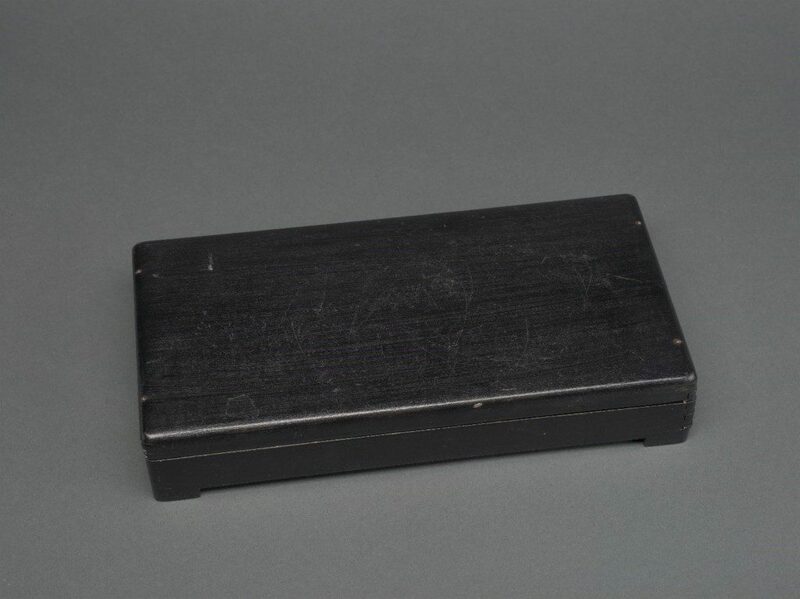 On June 22, 2017, I encountered a box by Joseph Cornell (1903–1972) that was new to me, and I believe new to the literature on the artist (figs. 1, 2). I was nearing the end of a short-term fellowship at the New York Public Library (NYPL) for the Performing Arts and had requested correspondence between Cornell and Lillian Moore (1911–1967), who was a dancer, dance historian, and former NYPL performing arts librarian.1 NYPL special collections librarian Jennifer Eberhardt, with whom I have worked for five years in the largely silent way specific to the archive, asked me if I was interested in Cornell and whether I would like to see their box by him.2 Yes, I was, and yes, I most definitely would. I wrote my master’s thesis on an issue of the magazine Dance Index by Cornell, and my dissertation includes a chapter on Cornell and his relationship to dance, so I searched my memory. I could remember no Cornell object connected to Moore, and I grew more excited when my quick internet searches also turned up nothing. Eberhardt arranged for Arlene Yu, the collections manager for the Jerome Robbins Dance Division (and another recurrent fixture in my yearly bursts of research at the library), to bring the object to the reading room. In all my time in the collections, I had seen no reference to anything connected to Cornell other than a few letters. As I discovered, the Moore/Cornell correspondence was much more significant than it had seemed at first. Moore was not merely another dance aficionado who exchanged a few letters with the sympathetic artist. Cornell corresponded with many interested parties outside of the visual art world, but only a few resulted in anything more than niceties. He was not a scholar, and at least one dance writer found his idiosyncratic missives confusing even to the point of offense.3 Moore was an important historian whose writing likely influenced some of Cornell’s most significant work, and she directly inspired the ballet box that Yu carried across the reading room to the final row of quiet tables in the Lincoln Center library. Yu set the box on the table, and my hands shook while I attempted to photograph it from every angle. She removed the lid and turned it over, revealing its title. I felt as I imagine Cornell must have in the first blushes of his love for the Romantic ballet, exhilarated by my proximity to the past. Like Cornell, my moment was facilitated by scholar-librarians who revealed a hidden story to me after years of quiet research. This encounter with art and dance history was only possible because of the generosity and attentiveness of Eberhardt and Yu. It was a new discovery, but neither truly new nor discovered. Cornell’s diaries are peppered with descriptions of exploring used bookstores and library collections, forever on the hunt for an authentic “bibelot” that would bring the past to him with multisensory vividness.4 I have only felt the unexpected thrill of discovery once: that June afternoon in the quiet archive of the New York Public Library, when I had unquestionably the most Cornellian moment of my life. Fig. 3. Joseph Cornell, detail of lid, From the Slipper of a Sylphide, 1949. Painted wood, glass, fabric, ribbon, glitter, and marbles, 8 1/2 x 4 1/4 x 1 5/8 in. Jerome Robbins Dance Division, The New York Public Library for the Performing Arts, Astor, Lenox and Tilden Foundations. © The Joseph and Robert Cornell Memorial Foundation/Licensed by VAGA, New York, NY. On New Year’s Day, 1950, when Cornell was forty-six years old and Moore was thirty-nine years old, he sent her a special package containing a “treasure” that should be “kept as you would . . . a piece of old china.”5This is not part of Moore’s catalogued correspondence, but Eberhardt was kind enough to forward me a scan of the letter after I left the library that evening. 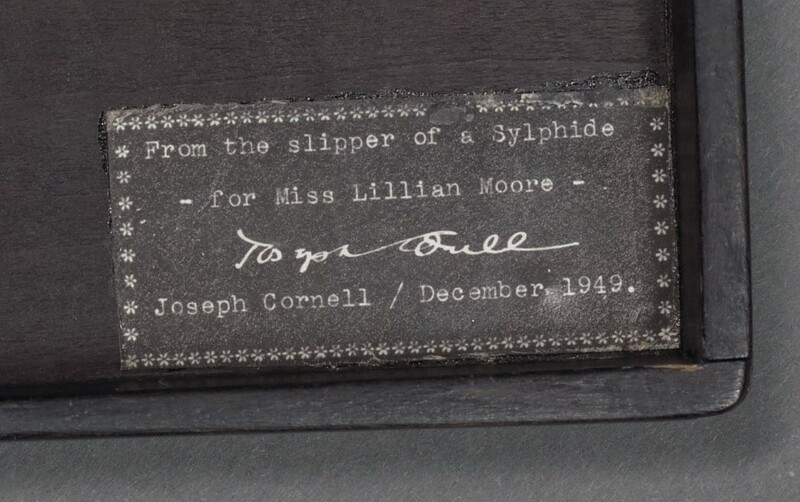 It had accompanied a black box, also uncatalogued, the size of a small book or a necklace case.6 A negative Photostat pasted in the bottom right corner of the underside of the lid gives the title of the object: “From the slipper of a Sylphide / —for Miss Lillian Moore—” (fig. 3). Cornell signs the label in script and types his name, clearly dating it: “December 1949.” In the custom-made joined box with smooth, curved corners, Cornell placed a length of ribbon, dyed blue to match the fabric lining of the box. The ribbon is pinned in place, wrapping around itself on the right side, arranged as though Cornell (or the Sylphide) draped it casually in a loose S-shaped arabesque. Marbles, small enough to be surrounded by the folds of the ribbon and the same deep blue as the fabric and ribbon, roll around the glass-enclosed space. When Yu picked up the box, the marbles moved into and out of the ribbon, settling in its folds. A small handful of loose blue glitter completes the composition, pooling in the left corner below the ribbon and speckling the bottom of the box like stars. The casket—a reliquary or jewel box—conceals its contents when closed.7 Moore could have displayed it in her dressing room and no one would have known it to be the work of the famous artist. The box commemorates, nearly to the day, the ninth anniversary of Cornell’s relationship with Moore, encapsulating a bit of the sparkle that she had lent to him with her positive response to his early ballet work. In a now-lost letter sent in December of 1940, Moore inquired about the veracity of a “Grisi item” in one of the artist’s early solo shows at the Julien Levy Gallery.8 Cornell’s response survives in Moore’s papers and reveals how pleased he was that a serious historian believed his imagined relic may have been authentic. In the letter of December 29, 1940, he references her 1938 book, Artists of the Dance, which he held in his personal library, now at the Joseph Cornell Study Center.9 The Sylphide box also serves as a bookend to his interest in ballet. It marked the tenth anniversary of his relationship with ballet-as-subject, sparked by ballet and art patron Lincoln Kirstein and related to Moore in the 1940 letter. While ballerinas would sometimes reappear in Cornell’s later collages, by 1950, he rarely felt the same motivation to create ballet boxes that he had in 1940 and 1941. As he tells Moore, “I have never made many of these miniatures, and with the exception of a couple things for the Ballets de Paris a few weeks ago, I’ve hardly done a new piece since before the war.”10 These two letters have become crucial markers of Cornell’s passion for the dance to me, concrete evidence of his effort to build relationships with the dance world through scholarship and the ways in which scholarship was the direct impetus for his work. Cornell’s correspondence with Moore, which lasted until at least 1961 via occasional postcards and holiday greetings, echoed his multivalent interest in the ballet. It was serious and scholarly enough for Moore to inquire about whether he owned a particular sheet music cover to illustrate a biography written by her friend, the important dance historian Ivor Guest.11 It was sincere, inspired by Cornell’s own experiences of performance but also by his brushes with Romantic ephemera. And it was fleeting, dependent on the flash of inspiration of his trouvailles in Manhattan bookstores, the availability of the research material at the Museum of Modern Art (MoMA) and area libraries, and the support of patrons and gallerists such as Kirstein and Levy. Such nondescript costumes and sets would be exactly what Kirstein-supported choreographer George Balanchine (1904–1983) adopted as he increasingly turned toward performances that evinced spare aesthetics and formalist movement, rejecting the theatrical and spectacular.15 Junyer goes on to describe romanticism as the greatest moment of cooperation between arts, when music, dance, and painting were equally united by the romantic impulse. Following Junyer, Cornell recreates the romantic as a memory of cooperation between the arts, one he saw might be fading away. Perhaps it felt right to Cornell to focus on the ballerinas in bursts, since so many Romantic ballet scenarios revolve around the temporary apparition and demise of beautiful women. Perhaps Cornell also accepted the slipping interest in ballet in the world of visual art. MoMA closed its dance department when the curator George Amberg resigned in 1948. The museum promised supporters it would present more dance-themed shows, but it divested its research collections and did not return to the subject for an exhibition until 1966.16 Balanchine and other ballet choreographers embraced formalism while many modernist dancers moved toward nonnarrative expressionism. At the same time that dance turned inward, Cornell, like much of the city’s art community, shifted from his neoromantic and surrealist mode toward abstraction, producing geometric “dovecotes” that would become vastly popular with art connoisseurs. As a result, his delicate ballet works have waned in the Cornell literature, eclipsed by the sharply focused boxes and evocative collage films that later artists and critics have loved. Bits of ribbon and glitter can seem hopelessly unserious; “inconsequential,” as Kirstein put it.17 But that very unseriousness was a commitment to the ephemeral, to the fragile, to objects and creatures that needed protection. Cornell created a facsimile of the romantic past to shield it as well as to contain it. With his gift to Balanchine-trained dancer Moore, he asked her to help him guard the treasure, to keep the Romantic ballet alive through his imaginary relics. The 1949 reliquary memorializes a dying kind of narrative ballet through a particular figure, the tragic Sylphide. Since Cornell does not include an article—“La” or “Les”—the box can refer to both to the 1832 Romantic ballet La Sylphide, made famous by Marie Taglioni, and the 1907 ballet blanc Les Sylphides, choreographed by Mikhail Fokine. The foundational 1832 Romantic ballet was often illustrated in the prized lithographs which Cornell and other balletomanes collected (fig. 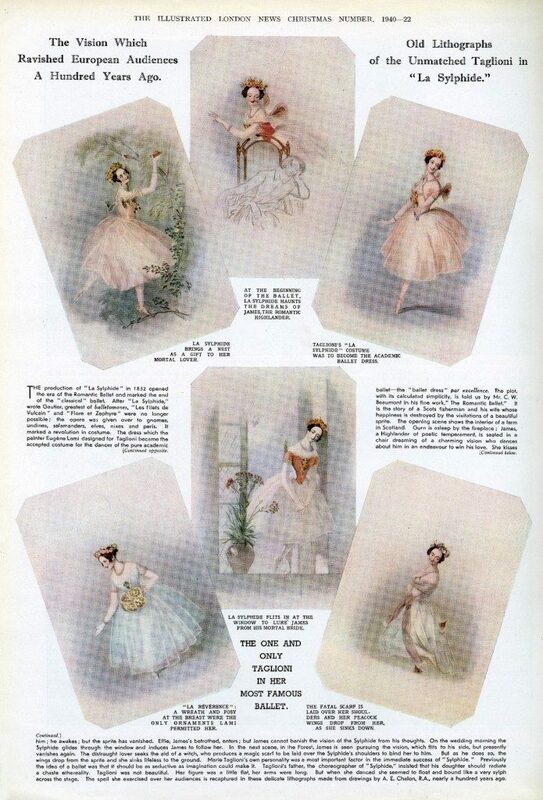 4).18 In some lithographs of Taglioni, the ballerina wears the flowing, ankle-revealing tutu that she popularized, with a blue ribbon emphasizing her waist.19 Moore would have immediately thought of the earlier dancer; she translated Taglioni’s letters for the magazine Dance in June 1945.20 A few issues of Dance survive in Cornell’s library and archives, including one from July 1945.21 Cornell expertly intertwines Taglioni and Moore, ballet women dedicated to bringing the past of the art to the present, connecting Cornell, as audience-artist, to performers in the nineteenth century and beyond. As was typical for him, he coalesces his referents. 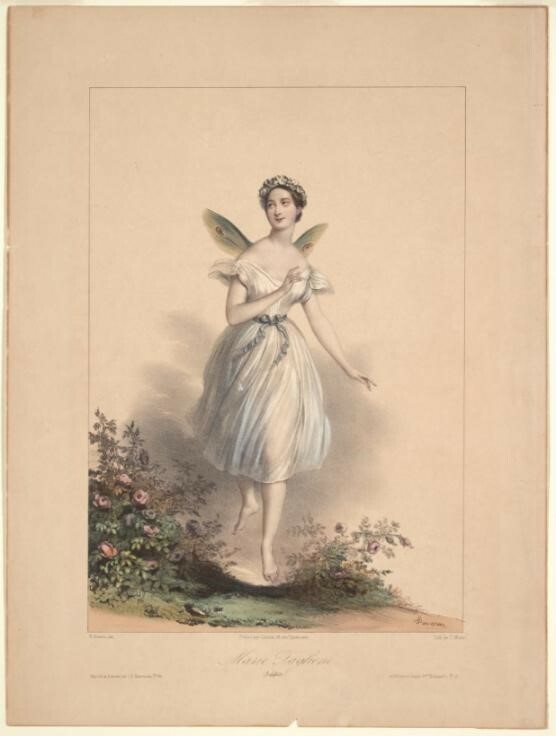 The Sylphide is Taglioni and Taglioni is the Sylphide, and perhaps all other dancers who performed her role are, too. Fig. 4. Charles Etienne Pierre Motte, after Achille Devéria, Marie Taglioni (Sylphide), c. 1830–39. Colored lithograph, 13 3/4 x 9 1/2 inches. Jerome Robbins Dance Division, The New York Public Library for the Performing Arts. Cornell does not title the box “from the slipper of Taglioni,” or “from the slipper of a member of the corps-de-ballet,” but instead “from the slipper of a Sylphide;” in other words, from the slipper of the character or the creature herself. Cornell captured a physical remnant of the impossible, of a winged creature dancing on her toes. This mythological air spirit, who appears flirtatiously but ultimately never consummates a relationship with a Scottish fisherman, must have spoken to Cornell’s overlapping interests: the weather, the immaterial, the ephemeral, and the spiritual (fig. 5). The doubly resonant ribbon would have recalled Taglioni’s innovation, central to contemporary ballet technique: her semilegendary invention of dancing en pointe. The ribbon “from the slipper” would then represent an artifact of a foundational dancer and of the half-magical technical achievement of a nineteenth-century celebrity. Through Les Sylphides, the glittering box recalls the flowering of Russian ballet (both the past and present of dancing in the United States) and the spiritual successor to Taglioni, Anna Pavlova.22 What an appropriately thoughtful and historically informed gift for a dance historian. The artist’s ballet work was accidental only in that he did not plan to devote himself to dance. In all other ways, his burgeoning balletomania was the result of the prolonged efforts of Kirstein and his circle to make dance a serious pursuit in the United States.26 Kirstein pulled Cornell into that project, hiring him to design covers and full issues of his scholarly magazine Dance Index.27 That magazine format would continue to interest Cornell until at least the mid-1950s, when he sent former Dance Index editor Donald Windham a design for an imagined magazine issue in the same distinctive size as that little magazine from the 1940s.28 Cornell loved the ephemeral and the accidental, and ballet seemed to him to be just those things. Ultimately, he was not very interested in the exigencies of actual ballet work. From the Slipper of a Sylphide is a real ribbon with an unreal story, inspired by a real and specific history. How appropriate, then, for his authentic-yet-inauthentic work to have been lost—yet not lost—in an archive for some fifty years, shelved near the romantic treasures he emulated. Perhaps Cornell would have been pleased that someone should stumble across it there and experience the same flush of archival discovery that he had chased across the libraries and bookshops of that same city. 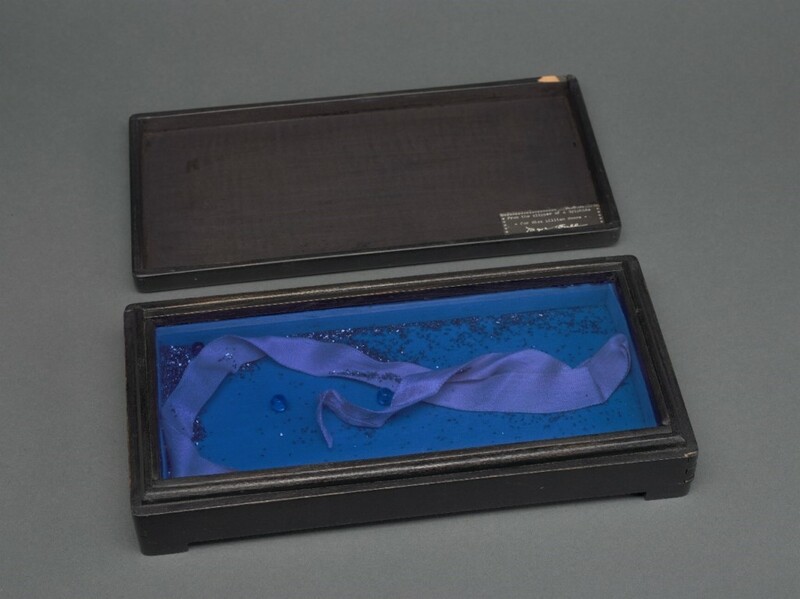 Cite this article: Elizabeth Welch, “From the Slipper of a Sylphide: A Box by Joseph Cornell,” Panorama: Journal of the Association of Historians of American Art 4, no. 1 (Spring 2018), https://doi.org/10.24926/24716839.1640. About the Author(s): Elizabeth Welch is a doctoral candidate in the Department of Art and Art History at the University of Texas at Austin.